I created this simple fall tablescape using my fall dishes and making a couple of diy projects. I painted the stems of some dollar store glasses to add some copper to the table. I also knitted a table runner to give some softness and texture to my fall tablescape. I am so thrilled to be included in the Fall Tablescape Tour where a group of bloggers showcase their fall tables hoping to give you some great ideas that you can use in your home. I really appreciate Chloe from Celebrate and Decorate including me because she is the queen of creating gorgeous tables! I am a big believer in that you can decorate your home without over spending. We are girls that love to be surrounded with pretty things, right? I think that it is so much fun to decorate my home with décor for each season, and I don’t want to spend too much because next year, I might want something a little different. My husband and I built this 8 foot table with a zinc top a few weeks ago and I am finding that they do not make runners for large tables. I want my runner to hang over the edge so I figured I would make one. I knitted the table runner in a couple of hours and I am so in love with it. It looks so soft and cozy, and I thought that it would be perfect for a fall or winter table setting. Visit Table Runner blog post for the super easy directions to knit a runner yourself. I had these solid colored dinner plates and salad plates that I love to use for fall. I can easily change my setting up every year by changing napkins or I can put a decorative plate on top. I purchased 6 glasses with stems at Fred’s for $1 a piece. I came home and painted the stems with old gold paint and I think that they look very expensive now. I used the color old gold because it has a copper look to it without being too red. I found some beautiful plaid napkins at Home Goods, and I had the wood grain chargers that I use often because they go with everything. I found 5 copper pumpkins and 1 brown pumpkin at the dollar store. I painted the one brown pumpkin with the paint that I used on my glasses and it looks just like the other ones. I found my dough bowl at the thrift store over a year ago. I think I spotted from across the store and ran for it like a crazy women on Black Friday. The stick pumpkins look like the bowl was made for them to sit in. I started to add more to my fall tablescape but I really didn’t want to cover up my beautiful handmade runner or my zinc table top! Now, my table is set and ready so bring on the cool weather!! Don’t forget to visit the other talented blogger’s homes to see their fall table and I hope you find some great ideas so that you can surround yourself with beautiful things for fall! You should be on HGTV! So many great projects and clever DIY! I love your idea of painting the stems of the glasses! Your knitted runner is fabulous! You could sell those for big bucks! That dough bowl was the greatest find! You have captured fall well with simple rustic elegance. Zinc table is amazing!!! Sherry, first, it was so good to see you at Haven again this year. Now, I am in love with your copper DIY wine glasses. Brilliant. Especially when you got the glasses for $1. We don’t have Fred’s (? 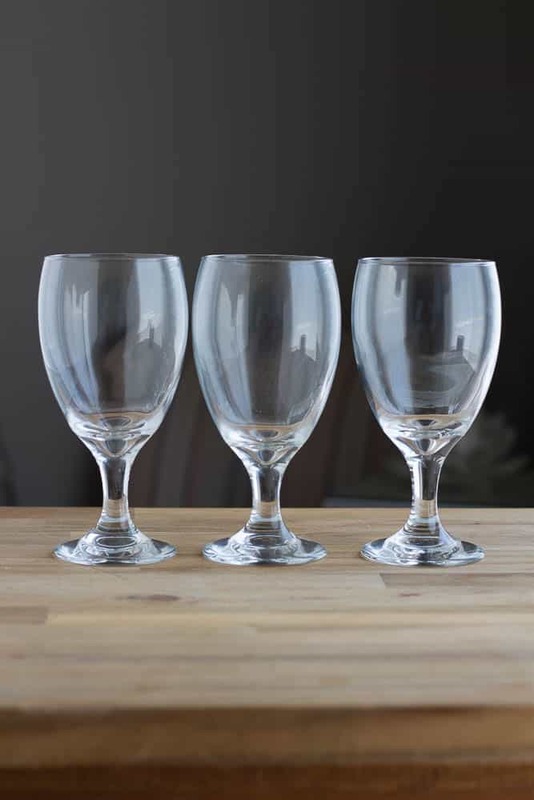 ), but I am going to scout out the dollar store for wine glasses. I have those stick pumpkins too. They never go out of style. And your knitted your table runner? I think it is so pretty. And you’re right. It would be lovely as part of a winter white tablescape. Sherry I love your simplistic tablescape…you have proven that sometimes less is more. I like that you are showcasing your lovely handmade table runner. It is beautiful and I am a bit jealous that I am not that creative when it comes to knitting, In fact I have several balls of yarn and knitting needles in a basket in my bedroom just begging me to get to “purling”….someday maybe. The dough bowl is a perfect centerpiece and I love what you did with your stemware and pumpkins. All in all a very lovely table. 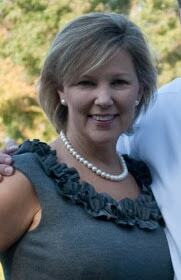 Sherry, the zinc topped table is beautiful and it is even better that your husband made it! 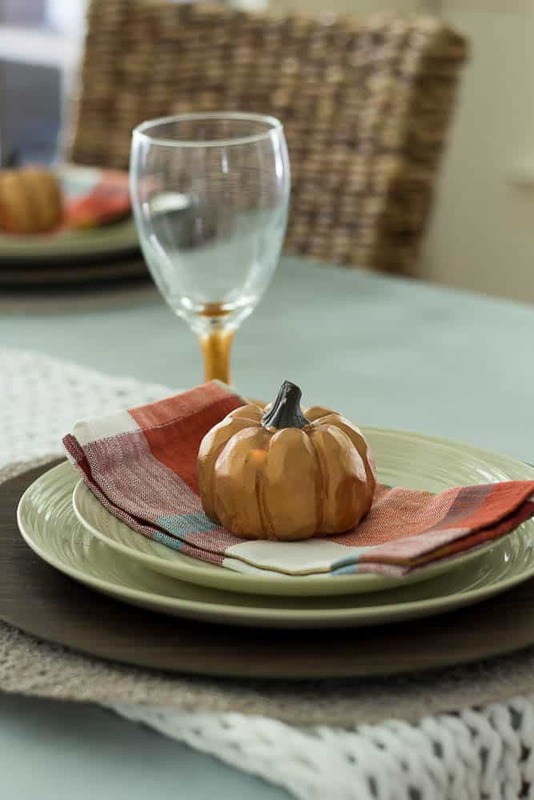 Now for that gorgeous runner…that is the piece de resistance…it gives a warm and cozy feel…so perfect for your autumn table. The dough bowl with pumpkins add the finishing touches! Love your tablescape! And the tablerunner and dough bowl. I might try knitting a table runner this winter. I am not a knitter, but you can bet I will be sharing this with my Mom with a not so subtle hint that I would really like a table runner like this for myself! Such a pretty, elegant tablescape that really speaks to the season! You are savvy in so many ways! 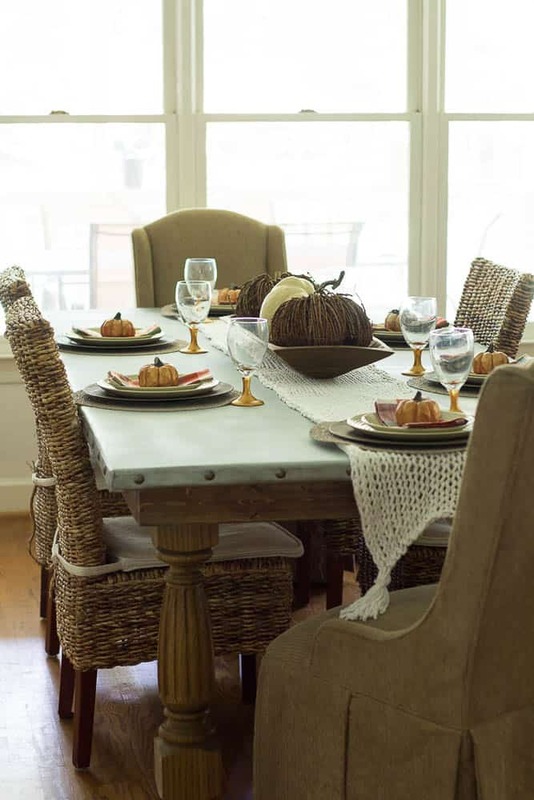 Love the table, runner, glasses – simply fall. I have to say your copper painted goblets are such an awesome idea. Stick pumpkins are always so much fun. Love the idea of the knitted table runner. I can see endless possibilities. Loving your chairs as well. What a lovely table. You should be so proud. Your zinc-topped table is gorgeous! And so is your knitted runner. Your painted glasses are lively and add such a warm glow. Your ideas are brilliant! What a warm, beautiful table! Love your knitted table runner, it adds a lot of textural interest. I enjoyed your story on the dough bowl! Pretty table!! I am so amazed at all of the DIY your tablescape is about! Lets start with that fantastic table! You and your husband really knocked it out of the park with your table, I am very impressed! Topping that table is your handmade runner and then the custom paint treatment on those glasses! Your pretty table puts other DIYers to shame! Your story about spotting your dough bowl put a smile on my face this morning! The pumpkins nestled in the dough bowl are a perfect nod to the season! Thank you for being a part of the tablescape blog hop! This is fantastic! The gorgeous zinc table is almost a show-stealer but not quite because you’ve decorated its surface wonderfully with just the right amount of colour and accents. 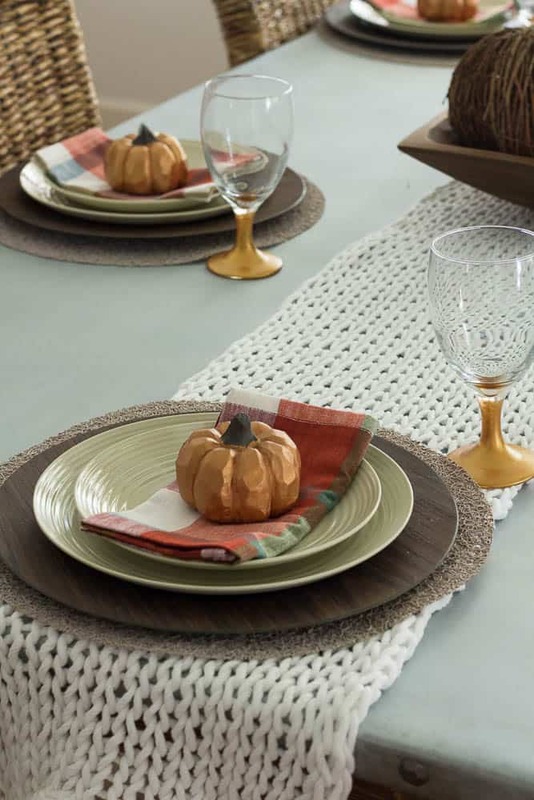 Love the painted glasses and pumpkins and the knitted runner is genius – you are right, it will be so perfect for cooler days of fall and winter. Really enjoyed seeing this! First of all I love that table! 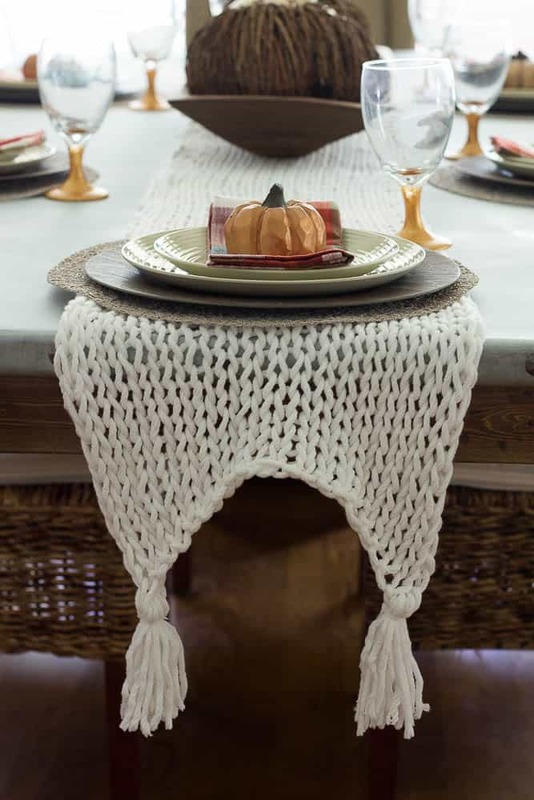 That crocheted table runner is so perfect! I love the glasses with the painted stems! Looks so classy! Your table is gorgeous!! I love the zinc top. Your styling is creative and I love the simplicity. I especially love your table runner – it will be a perfect accent well into winter! So fun hopping with you! What an incredible table! I adore your knitted table runner! I may have to try my hand on knitting one! Your decor is perfect and stunning! Beautiful fall tablescape (and table!) I love that you painted the glasses to fit your mood. They look great and no one would have known until you said something. I am loving the table runner you knitted too, its gorgeous! 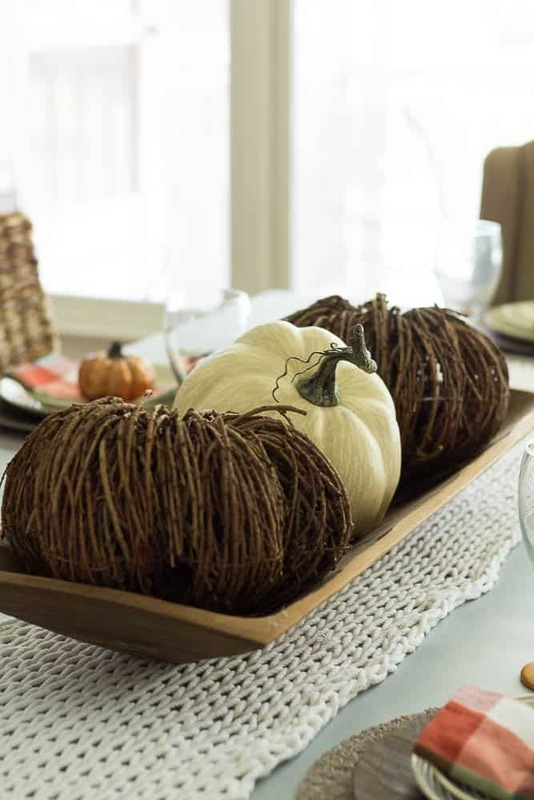 Your fall table is simple and stunning! I love the table your husband built- so pretty! I also like how you handpainted the stems of your goblets to match. Great job! So fun blog hopping with you this week. What a beautiful fall table, I love those pumpkins on each plate. I can’t believe you knitted the runner! It’s so gorgeous!! 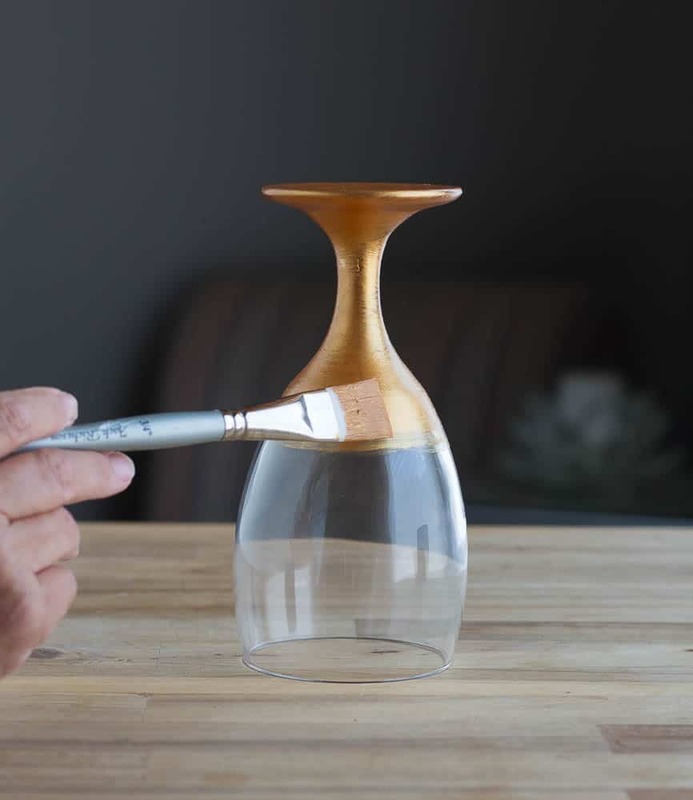 Great minds think alike with Painting stems of the wine glass! They definitely look expensive now! Such a beautiful warm tablescape! Love, love your knitted table runner. That is a lovely table! So restful and serene. 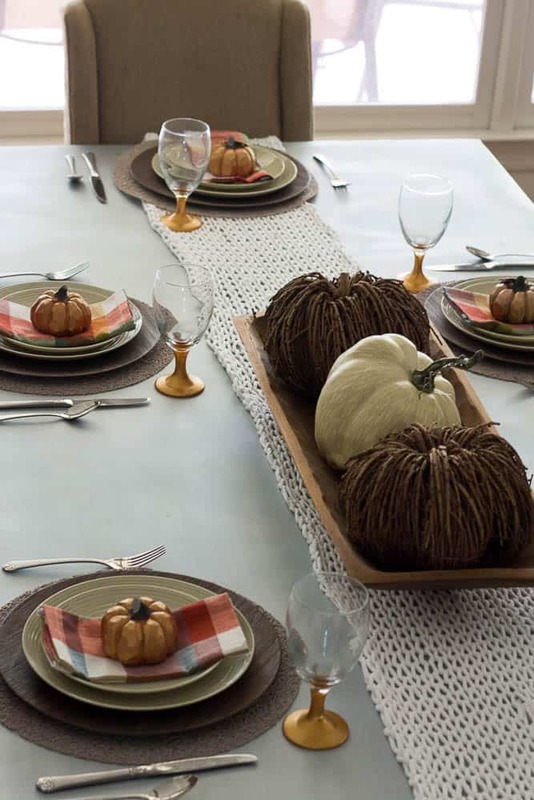 Love the stick pumpkins & the table runner is divine. And you did it all on a budget! Love it! Hey Sherry…you know I love that table…and you decorated it so lovely! 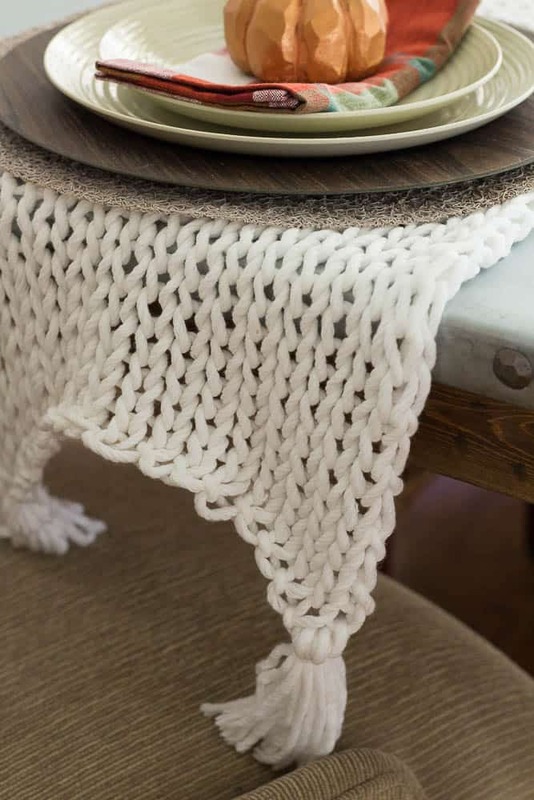 I dig that knit runner…it is perfect for not covering up your table. And how brilliant are you to paint those goblets. I love your decor. I have become a much more simple in design and decor, especially for holidays. Lovely table. The zinc top is great. When I first scrolled through I nearly missed that you made those beautiful glasses and you also knit the table runner. They are both lovely and just a few of the beautiful touches you added to your table. I need to start exploring my tablescape crafting skill, it needs a lot of work but beautiful tables like yours inspire me. I just love that knitted table runner – makes me want to knit again! And you and your hubby did an amazing job on the zink top wow. Beautiful….I love it all! Those little pumpkins are just darling and add so much to the table! In love with the pumpkins! Looks so festive. plan on pinning this.